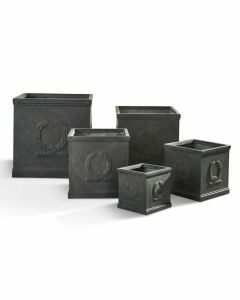 A long time favorite, these classic style planters are perfect for displaying a beautiful floral arrangement. Fibreclay has the look and feel of substantial outdoor planters. However, fibreclay is made of a composite of clay and other natural materials – creating an outdoor pot that is lighter than it looks. Retained salts, fertilizers and rain will be absorbed for a natural and attractive aging process. Protect from hard freeze and ensure drainage to avoid cracks. These pots have drain holes. The pots measure: 21.5’’ x 21.5’’ x 21.5’’, 17.5’’ x 17.5’’ x 17.5’’, 14.5’’ x 14.5’’ x 14.5’’, 12.5’’ x 12.5’’ x 12.5’’, and 10’’ x 10’’ x 10’’. Click image for greater details.